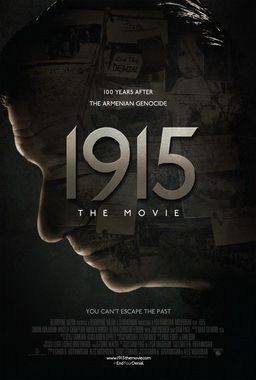 1915, written and directed by Garin Hovannisian and Alec Mouhibian, tells the story of Simon (Simon Abkarian), who is directing a play he has written about the Armenian genocide of 1915. His wife, Angela (Angela Sarafyan), who plays the lead character, immerses herself in her role in a manner that begins to disturb the other cast members. The play is controversial, and the director and producer receive death threats. It gradually becomes clear that Simon and Angela have a dark secret. One hopes that 1915 will create greater awareness of the Armenian genocide. This entry was posted on April 19, 2015 at 8:27 am and is filed under Armenian Genocide, Cinema. You can follow any responses to this entry through the RSS 2.0 feed. You can leave a response, or trackback from your own site. Reblogged this on anniewsm's Blog.